This article appeared in Fermilab Today on March 30, 2015. 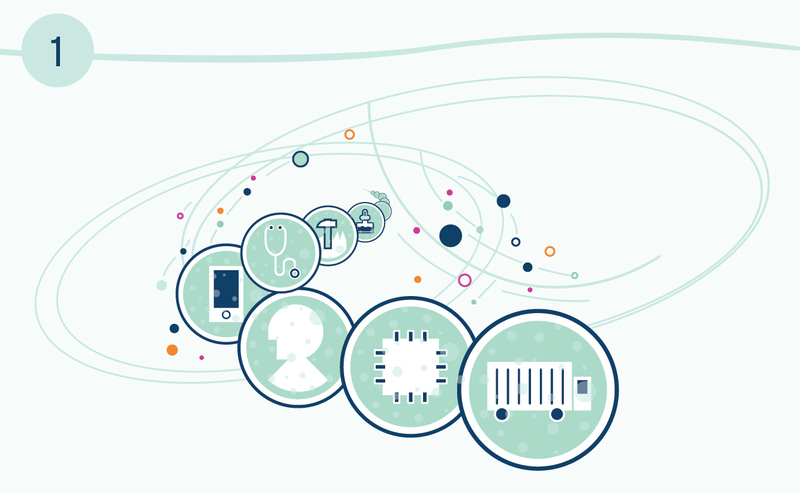 The newest particle accelerators and those of the future will be built with superconducting radio-frequency (SRF) cavities, and institutions around the world are working hard to develop this technology. Fermilab’s advanced superconducting test accelerator was built to take advantage of SRF technology accelerator research and development. On Friday, after more than seven years of planning and building by scientists and engineers, the accelerator has delivered its first beam. 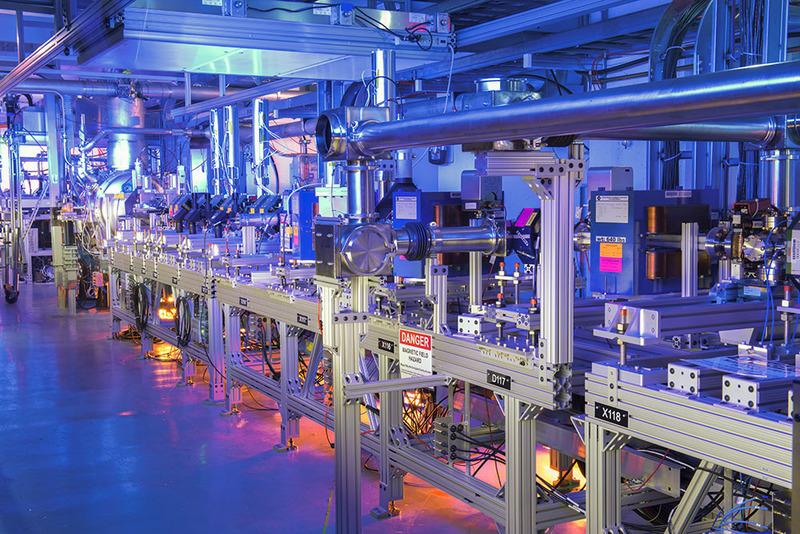 The Fermilab superconducting test accelerator is a linear accelerator (linac) with three main components: a photoinjector that includes an RF gun coupled to an ultraviolet-laser system, several cryomodules and a beamline. Electron bunches are produced when an ultraviolet pulse generated by the laser hits a cathode located on the back plate of the gun. Acceleration continues through two SRF cavities inside the cryomodules. After exiting the cryomodules, the bunches travel down a beamline, where researchers can assess them. 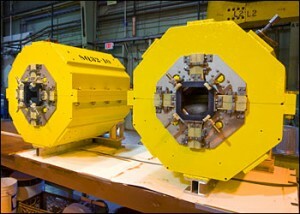 Each meter-long cavity consists of nine cells made from high-purity niobium. In order to become superconductive, the cavities sit in a vessel filled with superfluid liquid helium at temperatures close to absolute zero. As RF power pulses through these cavities, it creates an oscillating electric field that runs through the cells. If the charged particles meet the oscillating waves at the right phase, they are pushed forward and propelled down the accelerator. The major advantage of using superconductors is that the lack of electrical resistance allows virtually all the energy passing through to be used for accelerating particle beams, ultimately creating more efficient accelerators. “It’s more bang for the buck,” said Elvin Harms, one of the leaders of the commissioning effort. The superconducting test accelerator’s photoinjector gun first produced electrons in June 2013. In the current run, electrons are being shot through one single-cavity cryomodule, with a second, upgraded model to be installed in the next few months. 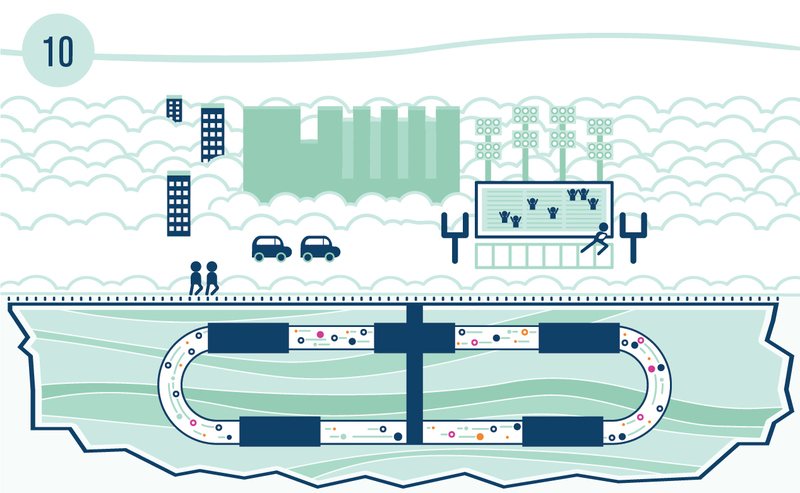 Future plans call for accelerating the electron beam through an eight-cavity cryomodule, CM2, which was the first to reach the specifications of the proposed International Linear Collider (ILC). Fermilab is one of the few facilities that provides space for advanced accelerator research and development. These experiments will help set the stage for future superconducting accelerators such as SLAC’s Linac Coherent Light Source II, of which Fermilab is one of several partner laboratories. “The linac is similar to other accelerators that exist, but the ability to use this type of setup to carry out accelerator science experiments and train students is unique,” said Philippe Piot, a physicist at Fermilab and professor at Northern Illinois University leading one of the first experiments at the test accelerator. A Fermilab team has designed and is beginning to construct the Integrable Optics Test Accelerator ring, a storage ring that will be attached to the superconducting test accelerator in the years to come. This article appeared in Fermilab Today on Feb. 11, 2015. 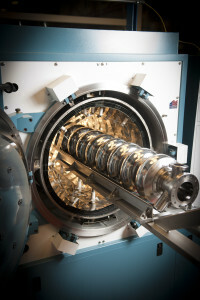 Now one year into its five-year construction plan, the Linac Coherent Light Source II, an electron accelerator project at SLAC, will produce a high-power free-electron laser for cutting-edge scientific explorations ranging from refined observations of molecules and cellular interactions to innovative materials engineering. Cornell University as well as Argonne National Laboratory, Lawrence Berkeley National Laboratory, Fermilab and Thomas Jefferson National Accelerator Facility are partners in the SLAC-directed project. In 2015, Fermilab will intensify its LCLS-II contribution in the overlapping areas of superconducting radio-frequency (SRF) accelerator technology and cryogenics, critical components that distinguish LCLS-II from SLAC’s current LCLS facility, whose laser production has enabled noted scientific investigations in cancer treatment and other important areas. SLAC physicist Marc Ross, LCLS-II cryogenics systems manager, said LCLS cannot keep up with scientists’ requests for use. The existing LCLS facility and LCLS-II combined will offer researchers laser X-rays with a wide range of properties. Fermilab Technical Division physicists Hasan Padamsee, division head, and Anna Grassellino and their team are working on SRF technology for LCLS-II, in particular on implementing Fermilab’s two recent findings to reduce the needed cryogenic power. In one innovation, known as nitrogen doping, Grassellino found that infusing a small amount of nitrogen gas when preparing the superconducting cavities — the structures through which beam is accelerated — reduces two main causes of the usually expected resistance to radio-frequency currents. “It is exciting to see our discovery becoming an enabling technology for LCLS-II,” Grassellino said. Grassellino’s high-Q team has also found that the cavities’ cooling dynamics significantly helps expel magnetic flux, another major source of cavity power dissipation. 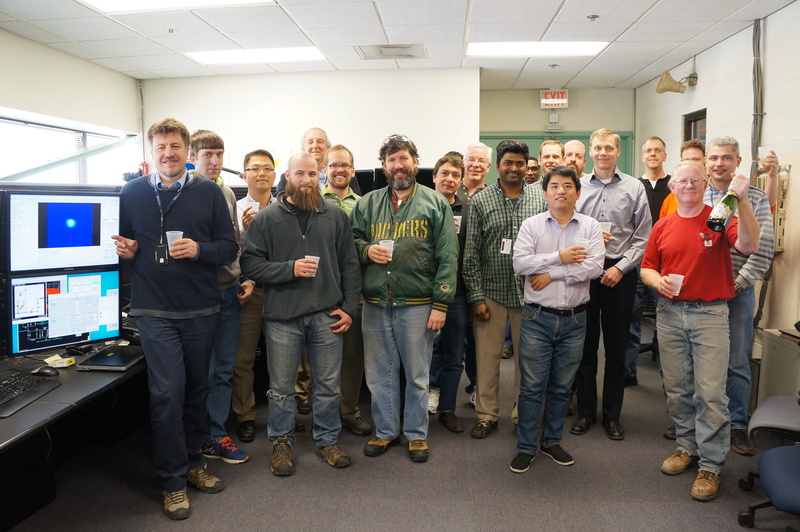 The Fermilab high-Q team, together with Cornell University and Jefferson Lab, are currently working on calibrating the cooling thermogradient for LCLS-II. Stanek said Fermilab is advancing its SRF work with its LCLS-II participation. Fermilab and Jefferson Lab are working closely together on the cooling systems that enable the cavities’ superconductivity. Fermilab scientist Camille Ginsburg leads LCLS-II cryomodule production at Fermilab, and Fermilab engineer Arkadiy Klebaner manages the LCLS-II cryomodules distribution system. A cryogenic plant generating the refrigeration, a cryogenic distribution system for transporting the refrigeration into cryomodules and the cryomodules themselves make up the LCLS-II cryogenics. Jefferson Lab will provide the cryogenic plant, and Fermilab is in charge of developing the cryogenic distribution system. Jefferson Lab and Fermilab are jointly developing LCLS-II’s 35 cryomodules, each one about 10 meters long. Fermilab’s contribution draws on the Tevatron’s cryogenics and on SRF research begun for the proposed International Linear Collider. The lab’s LCLS-II experience will also help with developing its planned PIP-II accelerator. “So when we build the next accelerator for Fermilab, PIP-II, then we will have already gotten a lap around the production race course,” Padamsee said. 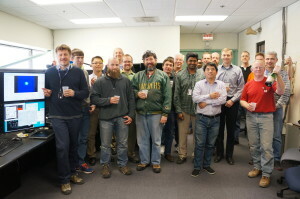 All labs have something special to contribute to LCLS-II, Ross said. A version of this article appeared in symmetry on April 14, 2014. The Large Hadron Collider at CERN laboratory has made its way into popular culture: Comedian John Stewart jokes about it on The Daily Show, character Sheldon Cooper dreams about it on The Big Bang Theory and fictional villains steal fictional antimatter from it in Angels & Demons. 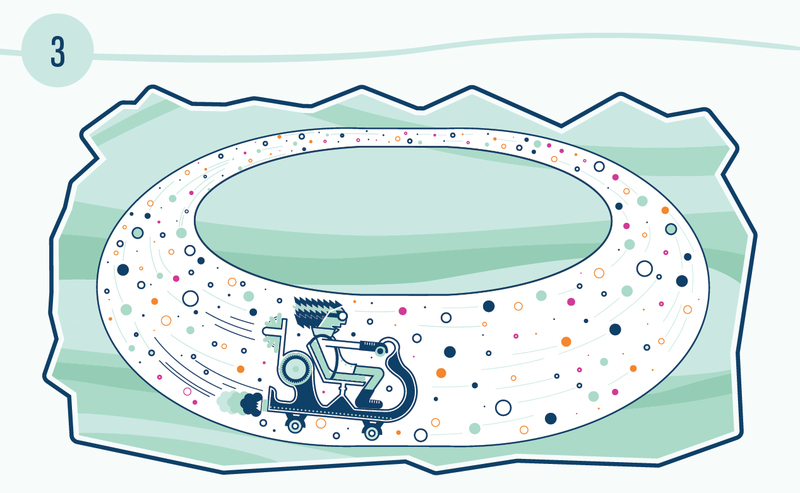 Despite their uptick in popularity, particle accelerators still have secrets to share. 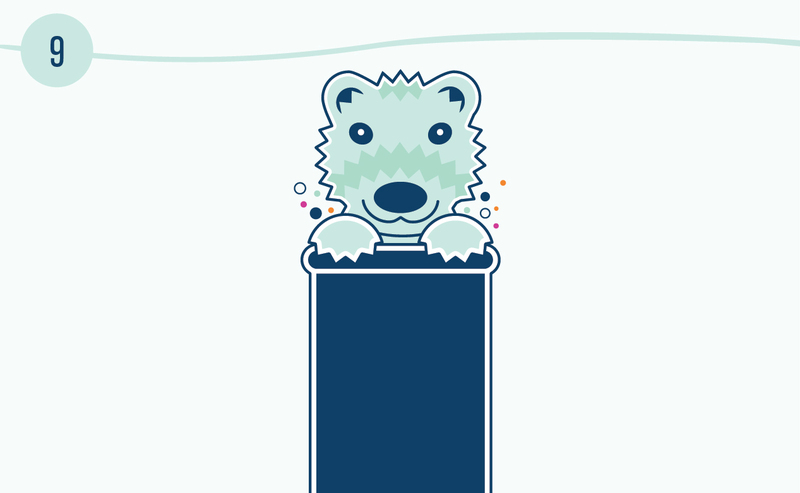 With input from scientists at laboratories and institutions worldwide, symmetry has compiled a list of 10 things you might not know about particle accelerators. There are more than 30,000 accelerators in operation around the world. Accelerators are all over the place, doing a variety of jobs. They may be best known for their role in particle physics research, but their other talents include: creating tumor-destroying beams to fight cancer; killing bacteria to prevent food-borne illnesses; developing better materials to produce more effective diapers and shrink wrap; and helping scientists improve fuel injection to make more efficient vehicles. One of the longest modern buildings in the world was built for a particle accelerator. Linear accelerators, or linacs for short, are designed to hurl a beam of particles in a straight line. In general, the longer the linac, the more powerful the particle punch. The linear accelerator at SLAC National Accelerator Laboratory, near San Francisco, is the largest on the planet. 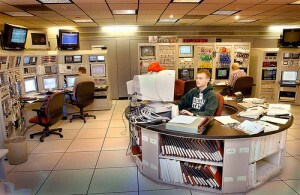 SLAC’s klystron gallery, a building that houses components that power the accelerator, sits atop the accelerator. It’s one of the world’s longest modern buildings. Overall, it’s a little less than 2 miles long, a feature that prompts laboratory employees to hold an annual footrace around its perimeter. Particle accelerators are the closest things we have to time machines, according to Stephen Hawking. In 2010, physicist Stephen Hawking wrote an article for the UK paper the Daily Mail explaining how it might be possible to travel through time. We would just need a particle accelerator large enough to accelerate humans the way we accelerate particles, he said. A person-accelerator with the capabilities of the Large Hadron Collider would move its passengers at close to the speed of light. Because of the effects of special relativity, a period of time that would appear to someone outside the machine to last several years would seem to the accelerating passengers to last only a few days. By the time they stepped off the LHC ride, they would be younger than the rest of us. Hawking wasn’t actually proposing we try to build such a machine. But he was pointing out a way that time travel already happens today. For example, particles called pi mesons are normally short-lived; they disintegrate after mere millionths of a second. But when they are accelerated to nearly the speed of light, their lifetimes expand dramatically. It seems that these particles are traveling in time, or at least experiencing time more slowly relative to other particles. The highest temperature recorded by a manmade device was achieved in a particle accelerator. 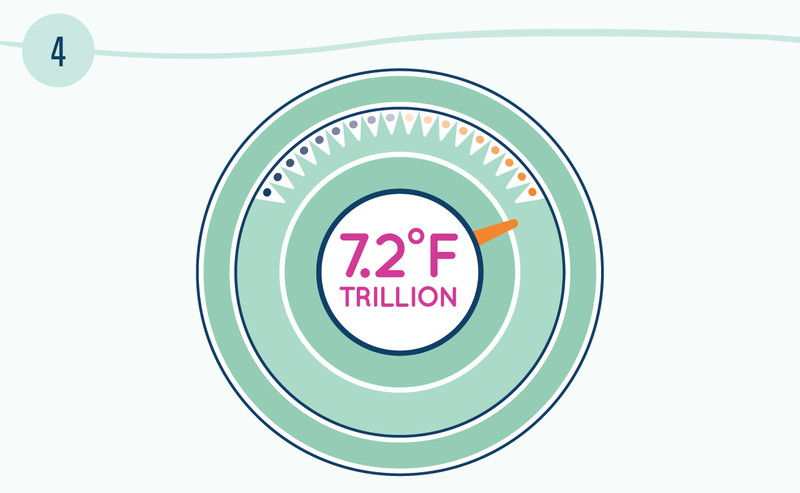 In 2012, Brookhaven National Laboratory’s Relativistic Heavy Ion Collider achieved a Guinness World Record for producing the world’s hottest manmade temperature, a blazing 7.2 trillion degrees Fahrenheit. But the Long Island-based lab did more than heat things up. It created a small amount of quark-gluon plasma, a state of matter thought to have dominated the universe’s earliest moments. This plasma is so hot that it causes elementary particles called quarks, which generally exist in nature only bound to other quarks, to break apart from one another. Scientists at CERN have since also created quark-gluon plasma, at an even higher temperature, in the Large Hadron Collider. 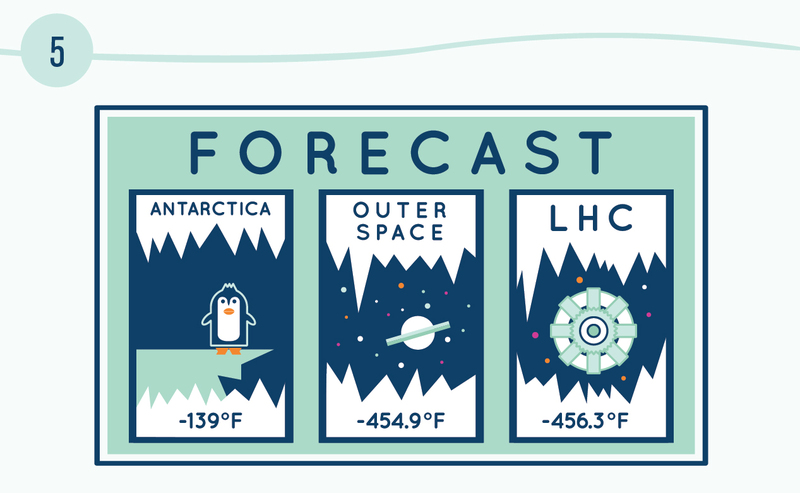 The inside of the Large Hadron Collider is colder than outer space. In order to conduct electricity without resistance, the Large Hadron Collider’s electromagnets are cooled down to cryogenic temperatures. The LHC is the largest cryogenic system in the world, and it operates at a frosty minus 456.3 degrees Fahrenheit. It is one of the coldest places on Earth, and it’s even a few degrees colder than outer space, which tends to rest at about minus 454.9 degrees Fahrenheit. Nature produces particle accelerators much more powerful than anything made on Earth. We can build some pretty impressive particle accelerators on Earth, but when it comes to achieving high energies, we’ve got nothing on particle accelerators that exist naturally in space. The most energetic cosmic ray ever observed was a proton accelerated to an energy of 300 million trillion electronvolts. No known source within our galaxy is powerful enough to have caused such an acceleration. Even the shockwave from the explosion of a star, which can send particles flying much more forcefully than a manmade accelerator, doesn’t quite have enough oomph. Scientists are still investigating the source of such ultra-high-energy cosmic rays. 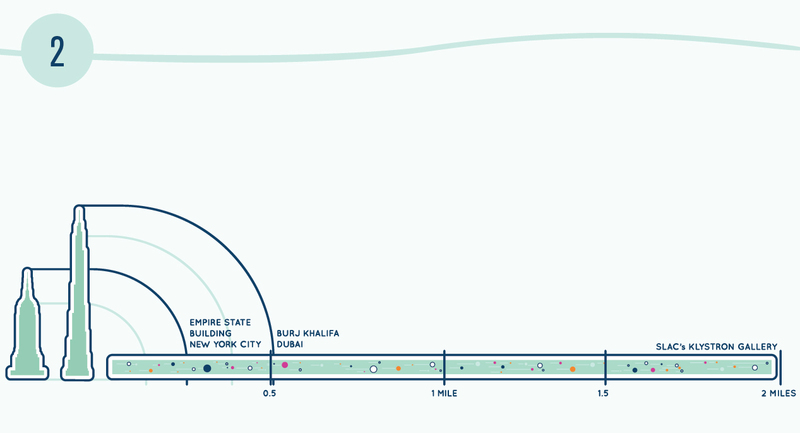 Particle accelerators don’t just accelerate particles; they also make them more massive. As Einstein predicted in his theory of relativity, no particle that has mass can travel as fast as the speed of light—about 186,000 miles per second. No matter how much energy one adds to an object with mass, its speed cannot reach that limit. In modern accelerators, particles are sped up to very nearly the speed of light. For example, the main injector at Fermi National Accelerator Laboratory accelerates protons to 0.99997 times the speed of light. As the speed of a particle gets closer and closer to the speed of light, an accelerator gives more and more of its boost to the particle’s kinetic energy. 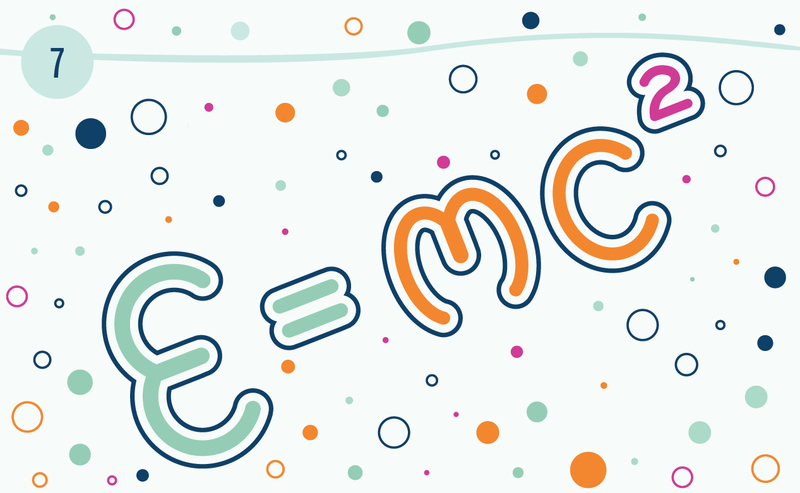 Since, as Einstein told us, an object’s energy is equal to its mass times the speed of light squared (E=mc2), adding energy is, in effect, also increasing the particles’ mass. Said another way: Where there is more “E,” there must be more “m.” As an object with mass approaches, but never reaches, the speed of light, its effective mass gets larger and larger. The diameter of the first circular accelerator was shorter than 5 inches; the diameter of the Large Hadron Collider is more than 5 miles. In 1930, inspired by the ideas of Norwegian engineer Rolf Widerøe, 27-year-old physicist Ernest Lawrence created the first circular particle accelerator at the University of California, Berkeley, with graduate student M. Stanley Livingston. It accelerated hydrogen ions up to energies of 80,000 electronvolts within a chamber less than 5 inches across. In 1931, Lawrence and Livingston set to work on an 11-inch accelerator. 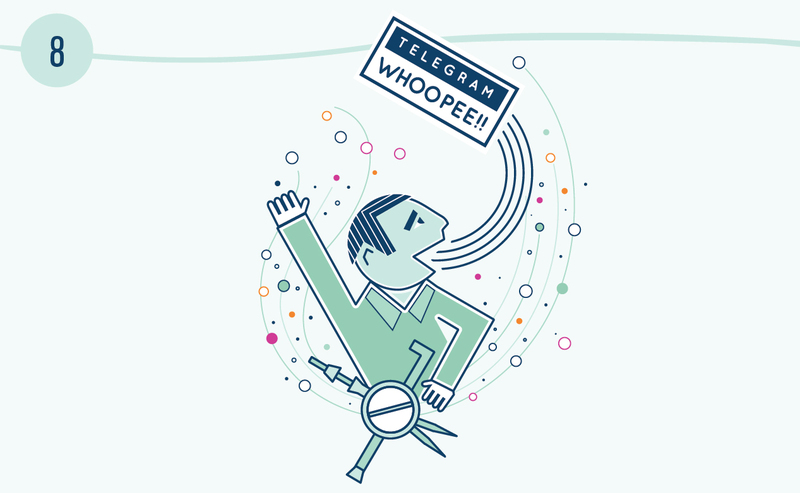 The machine managed to accelerate protons to just over 1 million electronvolts, a fact that Livingston reported to Lawrence by telegram with the added comment, “Whoopee!” Lawrence went on to build even larger accelerators—and to found Lawrence Berkeley and Lawrence Livermore laboratories. 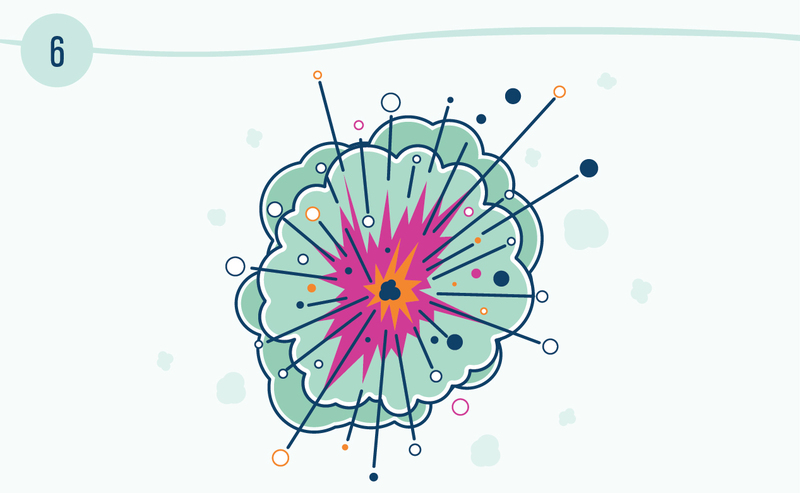 Particle accelerators have come a long way since then, creating brighter beams of particles with greater energies than previously imagined possible. The Large Hadron Collider at CERN is more than 5 miles in diameter (17 miles in circumference). 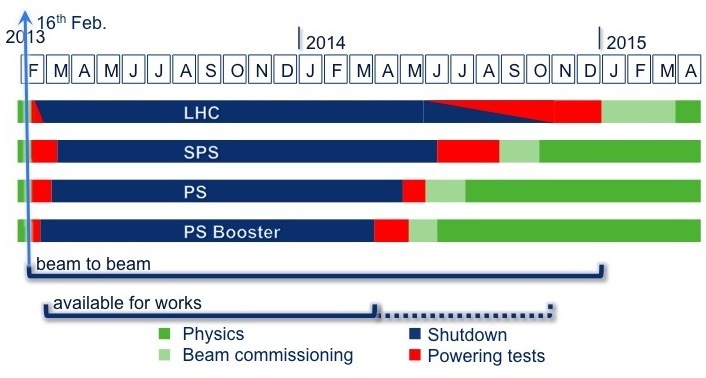 After this year’s upgrades, the LHC will be able to accelerate protons to 6.5 trillion electronvolts. In the 1970s, scientists at Fermi National Accelerator Laboratory employed a ferret named Felicia to clean accelerator parts. From 1971 until 1999, Fermilab’s Meson Laboratory was a key part of high-energy physics experiments at the laboratory. To learn more about the forces that hold our universe together, scientists there studied subatomic particles called mesons and protons. 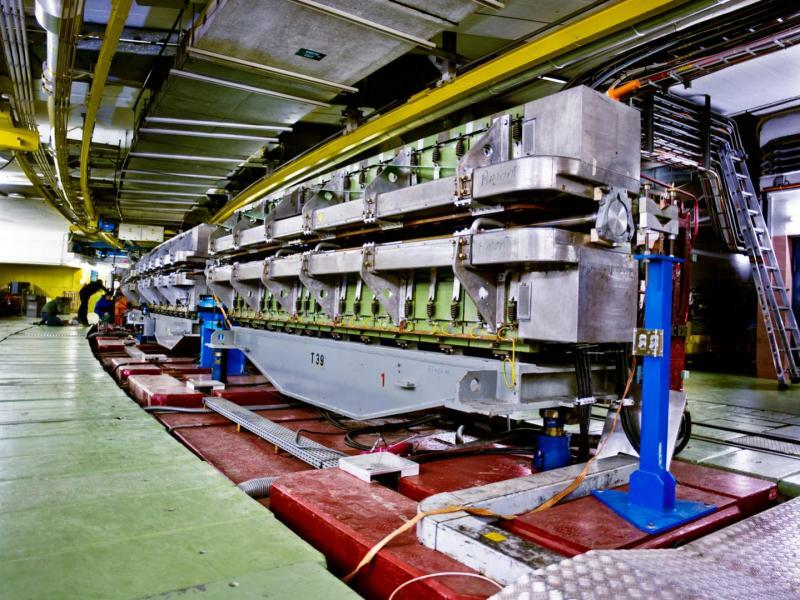 Operators would send beams of particles from an accelerator to the Meson Lab via a miles-long underground beam line. To ensure hundreds of feet of vacuum piping were clear of debris before connecting them and turning on the particle beam, the laboratory enlisted the help of one Felicia the ferret. Ferrets have an affinity for burrowing and clambering through holes, making them the perfect species for this job. Felicia’s task was to pull a rag dipped in cleaning solution on a string through long sections of pipe. Although Felicia’s work was eventually taken over by a specially designed robot, she played a unique and vital role in the construction process—and in return asked only for a steady diet of chicken livers, fish heads and hamburger meat. Particle accelerators show up in unlikely places. 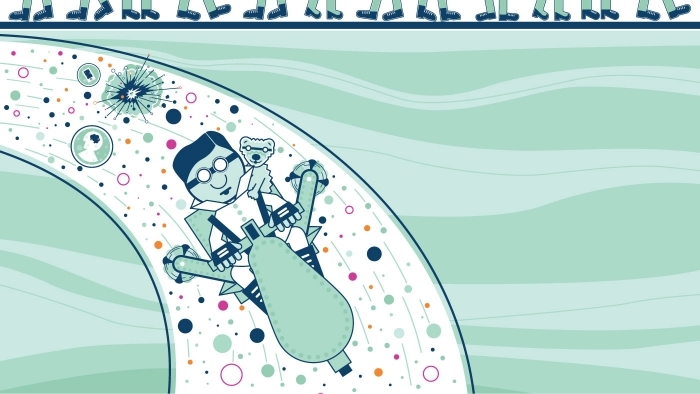 Scientists tend to construct large particle accelerators underground. This protects them from being bumped and destabilized, but can also make them a little harder to find. For example, motorists driving down Interstate 280 in northern California may not notice it, but the main accelerator at SLAC National Accelerator Laboratory runs underground just beneath their wheels. Residents in villages in the Swiss-French countryside live atop the highest-energy particle collider in the world, the Large Hadron Collider. And for decades, teams at Cornell University have played soccer, football and lacrosse on Robison Alumni Fields 40 feet above the Cornell Electron Storage Ring, or CESR. Scientists use the circular particle accelerator to study compact particle beams and to produce X-ray light for experiments in biology, materials science and physics. 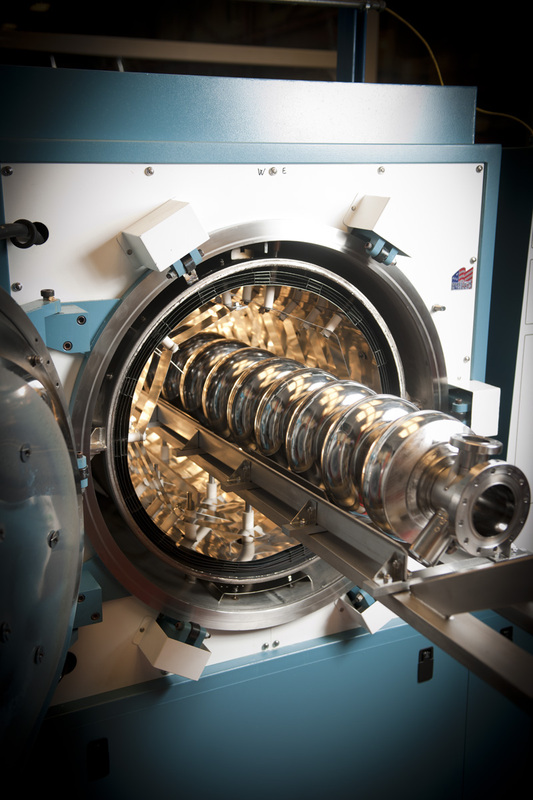 Brookhaven Lab’s oldest and most-trophied workhorse, the Alternating Gradient Synchrotron (AGS), has broke its own world record for producing intense beams of polarized protons – particles that “spin” in the same direction. Spin, a quantum property that describes a particle’s intrinsic angular momentum, is used in a wide range of fields, from astronomy to medical imaging. But where spin comes from is still unknown. In this picture of a proton-proton collision, the spin of the particles is shown as arrows circling the spherical particles. The red and green particles represent reaction products from the collision that are "seen" and analyzed by RHIC detectors. To explore the mystery of spin, Brookhaven’s Relativistic Heavy Ion Collider (RHIC) smashes beams of polarized protons at close to the speed of light. RHIC is the only machine in the world with this capability. 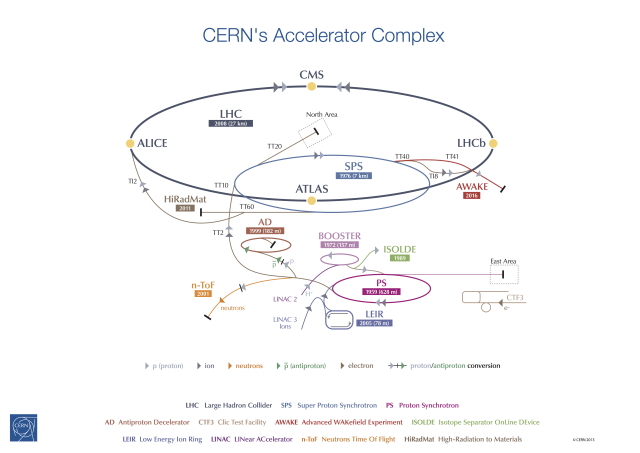 But before reaching RHIC’s high-speed collision course, the protons travel about one million miles through a series of linear and circular accelerators, including the AGS, a 41-year old circular accelerator more than a half mile around. Home to three of BNL’s seven Nobel Prize-winning discoveries, the AGS is Brookhaven’s longest-running accelerator. Now, with a new upgrade, the AGS can keep up to 75 percent of those particles in the beam polarized while they accelerate – a 5 to 8 percent increase over the previous record. This feat was accomplished with custom-built power supplies created from old inventory and two revamped 1960s quadrupole magnets pulled from storage. As the particles race through the AGS, two of the customized power supplies quickly pulse, hold, and pull back surges of power for each of the quadrupoles in a matter of milliseconds. Forty-two times within half a second, these pulsed currents produce magnetic kicks that keep the particles spinning in the correct direction. Last week I gave a colloquium at the University of Pennsylvania (Penn), my former institution of 22 years. I talked about the on-again off-again worldwide medical isotope crisis and the proposed Canadian solutions. It was not what they really expected, since after all I am a particle physicist and Director of TRIUMF, a particle and nuclear physics laboratory. But that was part of the appeal! Lots of friends and former colleagues from the department as well as quite a few from the medical school came to hear about the problem and our proposed solutions. Medical isotopes are used in roughly 40 million nuclear medicine procedures around the world and about half of these are in the U.S. The problem is a worldwide shortage of technetium-99m, or Tc-99m, the most popular medical isotope. It is used for heart perfusion imaging (which shows blood flow in the heart muscle, something a doctor wishes to see after a possible heart attack) and to identify bone metastasis. Tc-99m is made primarily in two ageing reactors, the NRU in Canada and the Petten in the Netherlands, both over 50 years old and showing signs of wear. About two years ago they managed to both go offline at the same time for an extended period for needed repairs. The ensuing medical isotope shortage made headlines around the world. The good news is that my audience seemed to stay awake. Better still, after the lecture, I asked one of the students what they learned and the answer was simply that accelerators were the answer. I was pleased. The message was apparently clear to at least one person…I must say, at least one highly perceptive person. My experience tells me that the best colloquia are the ones where the listeners go home that evening and share the story with their families. The day after the colloquium, one faculty member told me that he had discussed the issues with his kids that evening. Mission accomplished…sort of! Although there are several solutions to the medical isotope crisis being proposed with accelerators in Canada and now the U.S., and reactors in the U.S. and Europe, I focused in my talk primarily on the approach using small medical cyclotrons, a area of expertise of TRIUMF and Canadian industry (for example, ACSI in Vancouver, which grew out of a collaboration with TRIUMF two decades ago, and manufactures small medical cyclotrons with the prefix “TR”). Another company, BEST, located near Ottawa is also starting to manufacture small medical cyclotrons. In a nutshell, we think that a small cyclotron, a TR-19 for example, running with a few hundred micro-amps of beam current should be capable of supplying enough Tc-99m for a city of roughly 2 million people (think Vancouver). Much work is ongoing at the BC Cancer Agency, Lawson Health Centre in London Ontario, the Centre for Probe Development at McMaster University and TRIUMF. With luck, we will have a positive answer in about 15 months. The world will pay attention (we hope) and certainly our colleagues at Penn are paying attention since they have two small cyclotrons. Enough for Philadelphia? they asked. Let’s get off topic for a bit. Penn houses the oldest medical school in the United States (1765) and today has over 1700 full time faculty today. That is a huge program. The medical school complex is like a small city itself: throw in Children’s Hospital of Philadelphia (ranked as one of the best in the U.S. by U.S. News and World Report and ranked number one in pediatrics in 2008), the VA Hospital, the Children’s Seashore House Hospital…you get the picture. A new addition just down the street is the Abramson Cancer Center. I was peripherally involved in the embryo of what is now the new Roberts Proton Therapy Centre. The Roberts Proton Therapy Center is the world largest proton therapy center associated with an academic medical center in the world and one of only six such centers in the United States. (Canada does not have proton therapy except the small ocular melanoma program at TRIUMF.) The Roberts Proton Therapy Center features five treatment rooms: four gantries with 90-ton rotational machines designed to deliver the therapeutic beam at the precise angle prescribed by the physician, and one fixed-beam room. It is a very impressive facility. I have several friends who work at or are associated with the centre. Oh, did I mention it uses a cyclotron (manufactured by IBA, a Belgium company) to make the beams of protons. I am getting off topic—none of this was in my talk. Back to radiology. The original May 18th, 1903 NY Times article can be found online. That subject is still topical as we all know. “More recently, in 1964 David E. Kuhl developed the technique of Single Photon Emission Computed Tomography (SPECT) and the principles of Positron Emission Tomography (PET). In 1976 the world’s first FDG (fluorodeoxyglucose) PET image was obtained at Penn, starting an ongoing new era in functional imaging.” How big is that? The department currently performs more than 1,045,000 procedures annually. You get the picture…a busy place clinically and in research. In the last several months Penn has been in the press for developing an F-18 labeled molecule that attaches to amyloid plaque, a possible cause (or result) of Alzheimer’s disease. This is not the first such tracer to attach to the plaque. The best known is Pittsburgh Compound B or PIB that is labeled with C-11 which has only a 20 minutes half life (C-11 is an isotope of carbon with one less neutron) . PIB works well, and it has been used at TRIUMF and UBC. However only medical centres with cyclotrons can make PIB and thus its success has set off a rush to make a similar compound labeled with F-18 (not to be confused with CF-18, a Canadian jet fighter), which may be more practical because it can be shipped to a 2-hour radius. Eli Lilly just bought the small start-up company that developed the successful radiotracer. TRIUMF is not yet at the level of developing breakthrough radiotracers like this one. Once they are developed elsewhere, we make them and use them for research or supply them for clinical use to the local research communities. Penn’s Professor Cam Kuch developed a molecule EF5, which attaches to hypoxic tumours (tumours with reduced oxygen content). These tumours are radiation resistant and often require some treatment other than radiation….for example chemo-therapy. TRIUMF’s Mike Adam developed the chemistry to attach F-18 to this molecule and it is now used in PET imaging at the BC Cancer Agency for some patients to understand more about their cancerous tumour. Thanks Cam. Thanks Mike. I finished my talk, acknowledged my TRIUMF, UBC and BC Cancer colleagues who teach me about all the great research they are doing here in BC and I realized by the high level of interest at Penn in what we were doing that I had successfully brought coals to Newcastle ….or medical isotopes to Penn. Day 1 (Feb 27, 2011, in some time zone): Had dinner this evening with a postdoc and friend from TRIUMF, Smarajit, who has just joined the faculty at Delhi University (a small school…only 390,000 students!) as an assistant professor. I experienced golgappas. Basically it is an appetizer made of a crispy wafer in the shape of a hollowed-out pumpkin filled with spicy water. You put the whole thing in your mouth and let the flavours explode was my instruction from Smarajit. It exploded all right, my throat was on fire for 30 seconds making me speechless. Then Smarajit became concerned that I shouldn’t have drank it because the water may have come from the local tap. We asked the waiter and it did come from the tap. Oh well…too late now. Of course I went back for more. It was an experience worth repeating. Over dinner, we discussed the research trajectory his career might take over the next few years. I told him he has to first understand the funding system in India, make research connections in his department and university, with colleagues and labs in India and then finally internationally. Needless to say, for Smarjit, the international component would be the easiest because he has many connections around the world and established collaborations. The Indian University Accelerator Centre” (IUAC) is an ideal place to do experiments with stable beams because it is world class and is located in Delhi…very convenient. IUAC may be the most advanced institute in India for superconducting radio frequency accelerator research…the same area TRIUMF has focused on for accelerator development. Got up at 3:00 AM and headed to Delhi’s brand new beautiful and very large airport (opened July 2010 for the Commonwealth Games) on a new highway for the trip to Kolkata. Oh did I mention the automobile horn is undergoing phase-I trials in India….every car is expected to test out their horn essentially all the time. Day 2: Big news today is that England and India tie in a nail biter played in Bangalore. The game of cricket, brought to India by the “Britishers” (that is what the Indians call the British) is a game the Indians are crazy about, just like Canadians and ice hockey. The world cup game is a little like baseball, wooden bat, flat rather than round, big grass field in a large stadium, a batter and a pitcher or as they say bowler. No hot dogs but lots of dahl. Not sure about beer sales in the stadium but Indians like beer (and scotch). Fans do paint their faces and are “engaged” in the game like everywhere else. In cricket there are fixed number of pitches for each side. Called “Overs,” or six legal pitches, they play each for 50 Overs or 300 pitches. To score you must hit the ball and be able to run between the wickets. There are two wickets, 20 feet apart, two batters, one end to be bowled to at any given time. One team bats, 11 players each side, roughly half are bowlers. The games big name, an Indian named Sachin Tendulkar (“Cricket is my religion and Sachin is my god,” they say), is called the master blaster. No more need be said. This year Australia has a good team, India, and Sri Lanka. One high point for me was that Canada had a team in the world cup. I did not know that. When Canada played Zimbabwe, the Indian newspaper Hindustantimes called it the battle of the “minnows.” That’s not good for sure. Perhaps if they used cricket bats instead of than hockey sticks they would do better. After a hair raising “yikes” ride from the airport, (I’ll never complain about Vancouver traffic again) to the Kolkata Variable Energy Cyclotron Centre (VECC) we checked into our rooms at the new dorm. My first thought was how many people are killed in India in car accidents. They said not too many but it came out later the number is 85,000 per year, or eight times the US, which is also high especially when you take into account the relative number of drivers. More people in India but not that many drive as much as in the US! We pretty much started our collaboration meeting upon arrival. The meeting started with the Director of VECC, Rakesh Bhandari, welcoming us and then presenting the plans for his laboratory. I followed with the status and plans for TRIUMF. Both teams made interwoven presentations all day focused on the VECC test as we now call it. This is the 30kW electron beam test we must complete together (according to our MOU) by March 2012…a tight schedule. It will include a 300 keV electron gun, a low energy beam transport and de-buncher, and an accelerating section called the injector cryomodule or ICM. We are building two such modules together…referred to as ICM1 and ICM2…one stays at TRIUMF after the test and one is shipped to India. Then we got started with detailed presentations by Lia Merminga, Head of TRIUMF’s Accelerator Division, Bob Laxdal, Head of our SRF Department and co-Deputy Division Head , and Amiya Mitra, Head of our RF group (Amiya is originally from Bengal). The room was full (~25 people) of young Indian physicists and engineers, a good mix of men and women…lots of questions and interest from them. VECC is planning a major new isotope facility, called ANURIB, which stands for “A National Facility for Unstable Rare Isotope Beams.” The young researchers and engineers are getting intellectually engaged in the scientific and technical design challenges of the planned project. Interestingly, we learned that VECC is expanding to a new “green field” site called Raharjat in a few years which allows them to grow their present rare isotope beam facility. There were numerous hot tea and cookie breaks through the day…to keep us awake….jet lag had set in already. The TRIUMF/VECC collaboration works well because we have similar goals but neither lab individually has the resources to do what they wish to do… so pooling our resources makes a lot of sense. VECC presently uses its room-temperature cyclotron (they have just commissioned a superconducting cyclotron as well) to accelerate protons (or alphas) and then send them to strike a thick target that then produces various unstable nuclei. They do experiments with materials as well as nuclear physics. After the target they have a few acceleration stages that increases the beam energy up to 1.2 MeV per nucleon. Their plan is to reach 2.0 MeV per nucleon. They wish to do this by collaborating with TRIUMF on a superconducting radio frequency (SRF) technology heavy ion linear accelerator, an area of expertise of TRIUMF. At the end of the day we went for dinner is a restaurant downtown…about 15 people. It was a pleasant evening, food was great, beer was better, and the discussion moved in and out of physics and life in India. Surprisingingisinginglyly (southern India spelling of surprising), there was only one other vegetarian besides myself. Statistically, about 40% of Indians are vegetarian. What’s with the scientists?… or maybe Bengalis? The director’s wife joined us later. She is a school teacher and she taught English and Hindi to grade 11 and 12 students…basically two official languages, although as we gathered fairly quickly, the Bengalis have their own language, use it and wish to keep it…. sound familiar? She was late grading papers from an exam earlier in the day and needed to finish and post grades. She described her students as serious students, over 80 in one class, 60 in another, and she enjoyed her job. They better be serious with that many high school kids in a class. I was exhausted after my first day, happy with the progress and happy to hit the hay that evening. Day 3: Feeling good…. more like a person after a good night’s sleep. Walked around the site with Bob Laxdal to make sure we understood each other on various priorities for the VECC test. The site is about 12 acres in size surrounded by either a fence or brick walls. VECC is in a residential area, with houses across the street, cars honking and people walking or cycling by all the time. Bob is the lead scientist for the test and is responsible for the schedule. The day started off in the Director’s meeting room where we discussed further our plans for collaboration. It is the Year of India in Canada and we discussed having some kind of collaboration event later in the year in Canada. That would be nice. Our MOU requires us to meet once per year in each location and review progress. This is a way of making sure each side delivers what it agreed to do. In general, we are a little behind schedule and so we spent time discussing how to catch up before one of the “major milestones” March 2012, when we planned a joint beam test at TRIUMF which we refer to as the VECC test. We then went to the conference room and the final presentations were made. In the late afternoon we drove out to the new 25 acre green field site near the airport with chief civil engineer and saw the first evidence of power being brought onto the site. Occupancy is still a few years away. Bob headed off to the airport and the rest of us went to dinner downtown. We discussed the VECC plan to add the first accelerating cryomodule (ACM1) after the ICM only after moving to the green field site. This means the tests at VECC will be limited to about 25 MeV….they seem happy with that. If you were expecting this blog entry to be about the great song from the Friends of Distinction, it unfortunately won’t be the case. Instead, I’m taking you on the first trip this year of RHIC’s Yellow beam, one of two oppositely circulating particle beams that collide in the center of RHIC’s detectors. Why? Because the main goal of my first shift of Run11 was to get our particles to circulate in a closed orbit in the Yellow beamline. This will also give me the opportunity to get back to some of the technical terms I used in my previous post. So allow me to go over a little bit of accelerator physics theory for a minute. What’s special about Waterloo? Well, to the great followers of particle physics, the Perimeter Institute for Theoretical Physics is based in Waterloo, Ontario. This amazing institute, which celebrated its tenth birthday just last year, was bankrolled with a cool $50 million from the owner of the Canadian company which invented the Blackberry. Now that’s pretty sweet. I’m not a theoretical physicist and TRIUMF is primarily a laboratory dedicated to experimental physics—we have a theory group, but they are out numbered about 10:1 here—so what was going on? Well, TRIUMF got together with the Perimeter Institute (known affectionately as PI) and SNOLAB (Canada’s deep underground science laboratory and successor to SNO where the solar neutrino problem was solved) to discuss Team Canada. No, not the hockey team that beat the pants off the USA in the Vancouver 2010 Olympics—barely, says my hurt American ego—but a Team Canada that joins our three labs together. The topic of conversation for the visit was “What could Canada achieve if these three labs were to work together; a world-class accelerator laboratory, a world-class theory institute, and a world-class deep underground science lab? The idea of Team Canada is a quiet revolution for Canada’s national identity. Traditionally, Canada has thought of itself as a peacemaker, an intermediary, and a good kid brother. For Canada to seek first place, to show up its bigger sibling to the South, to compete for dominance in an area…that’s new. That’s 21st century. The “Own the Podium” program that helped select and train the best winter athletes for the 2010 Olympics was not only amazing in its success for the Games but also in its audacity in challenging traditional Canadian views. In science, the same thing is happening. Where can “Team Canada” play to its strengths and win big-time in science? The first step is finding the team and choosing the game. And that’s what we were doing in Waterloo. The three laboratory directors (Nigel L, Nigel S, and Neal T) first talked about what “players” they had (i.e., areas of strength) and then started to brainstorm some of the burning questions in science that might yield to their combined efforts. Although not feasible the short term, an example would be something like primordial neutrinos. These are the neutrinos that originated moments after the Big Bang and, like the cosmic microwave background radiation, would offer a detailed fingerprint of the early moments of creation. These neutrinos are so incredibly low in energy that there really is no current technology that can systematically detect them and develop a map of the sky like we do with survey telescopes. But, let’s say TRIUMF did find a technical solution. PI would be able to generate the detailed theoretical predictions about what to look for and how to interpret the data. And SNOLAB would be the obvious and preferred location to place the detector because it is so deep underground that the noisy background of “other stuff” that rains down out of the atmosphere is heavily reduced. So, by combining forces, Canada would have a truly global advantage in addressing this science topic. It was a fantastic discussion and clearly the first of many joint efforts. We look forward to a win with Team Canada!